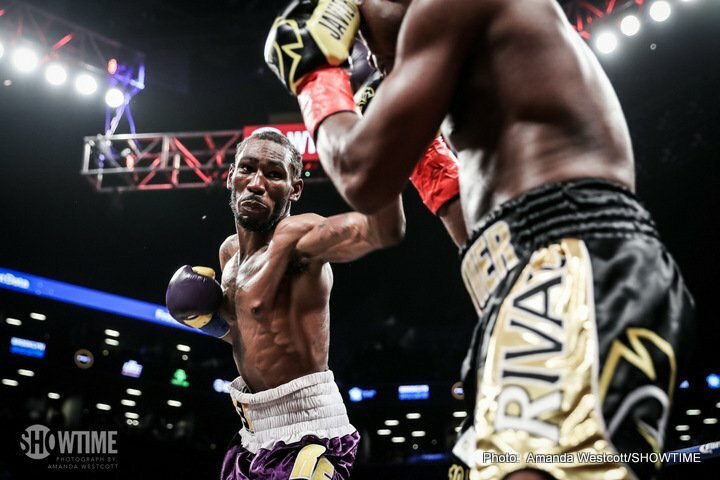 IBF World lightweight champion Robert Easter Jr. (21-0, 14 KOs) retained his IBF title in beating former super featherweight champion Javier Fortuna (33-2-1, 23 KOs) by a 12 round split decision on Saturday night at the Barclays Center in Brooklyn, New York. The scores were 114-113, 115-112 for Easter and 114-113 for Fortuna. Fortuna lost a point for throwing 3 rabbit punches in round 2. After round 3, Fortuna’s work rate dropped off and he appeared to lose most of the rounds simply by fighting off the ropes. The fight was close in the end, but the 26-year-old Easter Jr. appeared to do enough to deserve the win. What was strange about the fight was how the much taller 5’11” chose to battle the shorter 5’6” Fortuna on the inside for most of the fight despite having 5 inch height and 8 inch reach advantage. It looked like Easter Jr. had no confidence in his ability to fight on the outside. One reason for that is he kept getting beaten to the punch by Fortuna. Easter’s slow shots were easily countered by Fortuna, and he was getting hit with punches from all angles. There was a lot of clinching and wrestling going on in the fight. It was boring to watch much of the time because neither fighter was landing anything of note when they were mauling on the inside. Fortuna occasionally would land a nice shot like the left hand that he hurt Easter with in round 6. Easter Jr. was fortunate to get the decision tonight, as he was hit with some significant pot shots in each round. The judge that scored the fight in favor of Fortuna by a 114-113 score, John McKaie, was more impressed with his hard pot shots than the busier work by Easter Jr. Easter’s more constant work made him look like the winner, but the British judge liked the cleaner shots from Fortuna despite there being far fewer of them. Fortuna’s penalization for throwing a rabbit punch in the 2nd round proved to be his undoing, as if that hadn’t happened, the fight would have wound up as a 12 round draw instead of a loss for him. Fortuna still wouldn’t have won the IBF title, but at least he would have avoided a loss. Fortuna had no chance of fighting for the IBF title due to him coming over the 135 lb. limit at Friday’s weigh-in. The boxing fans didn’t like the results of the close win for Easter Jr., but that’s likely because they were more impressed with the pot shots that Fortuna was landing. Fortuna didn’t do enough in many of the rounds to get the win. Fortuna was missing in action in rounds 7, 8, 9 10 and 11. He did nothing in those rounds.